The Taj Mahal is widely considered one of the most beautiful—and romantic—buildings in the world, but there are probably a few things you don't know about India's most ornate mausoleum. 1. THE TAJ MAHAL WAS BUILT TO HONOR THE FAVORITE WIFE OF AN EMPEROR. Like many of his predecessors, Shah Jahan married several wives over the course of his adult life. Although Shah Jahan spread his heart around, none of these ladies found quite the same favor as his third wife (but first love), Arjumand Banu Begum, more famously known as Mumtaz Mahal. Their union lasted 19 years and led to the birth of 14 children. Complications during the birth of the final child led to Mahal’s untimely passing at the age of 39. Shah Jahan was so stricken by the loss of his longtime companion that he decided to memorialize Mahal with a spectacular tomb. Construction on the Mahal and its surroundings began in 1632, one year after her death, and continued for just over two decades. 2. THE ONLY PART OF THE MAUSOLEUM THAT IS NOT ORNATELY DECORATED IS THE ACTUAL GRAVE. Per Muslim law, graves cannot be adorned with elaborate decoration, which would be an inappropriate expression of vanity. This rule explains the comparatively drab design of the lower level of the palace where Shah Jahan laid his wife to rest. 3. THE GRAVE SITE IS ALSO THE ONLY PART THAT IS NOT PERFECTLY SYMMETRICAL. The Taj Mahal is any obsessive’s dream, with meticulous symmetry across its long and wide diameters. The sole exception to this otherwise uniform aesthetic scheme lies, again, in the gravesite. Mumtaz Mahal’s casket is located in the exact center of the palace crypt, but it is Shah Jahan’s grave—introduced to the mausoleum following his death in 1666—that rocks its artistic equilibrium with a west-of-center resting place. 4. THE PALACE WAS DESIGNED SO THAT EVERYTHING WOULD FALL AWAY FROM THE TOMB IN THE EVENT OF A COLLAPSE. The placement of the Taj Mahal’s four minarets—the 130-foot-tall spires at the edge of the platform—was not an aesthetic choice but a strategic one. In the 17th century, it was hardly uncommon for massive architectural ventures to fall victim to their own weight. In order to protect the crypt of Mumtaz Mahal, chief architect Ustad Ahmad Lahauri tilted the towers slightly so that they would fall away from the rest of the Taj Mahal, preventing the grave from incurring any damages. 5. THIS KIND OF COLLAPSE REMAINS A VERY REAL CONCERN. The passing years have only heightened worries about the monument’s structural integrity. In the 20th century, surveyors began to notice signs of structural decay that originated with the neighboring Yamuna River’s gradual drying. Scientists have even observed that between the 1980s and today, one of the minarets has undergone a one-and-a-half-inch shift. More extreme assessments of the situation predict that the Taj Mahal will collapse entirely by 2016, but the Architectural Survey of India has dismissed such projections and promised that the iconic building will be secure for the foreseeable future. 6. CONSTRUCTION DEMANDED A TREMENDOUS AMOUNT OF MANPOWER. Architect Lahauri led a team of 20,000 artisans in the development of the Taj Mahal. 7. …AND A GOOD DEAL OF ELEPHANT-POWER, TOO. About a thousand elephants handled the transport of heavy building materials during the two-decade construction project. 8. THE TAJ MAHAL’S CALLIGRAPHER SIGNED HIS WORK WITH A SELF-DEPRECATING TITLE. Countless beautifully printed lines of Muslim scripture line the walls of the Taj Mahal, each of which was transcribed from the Quran under the supervision of head calligrapher Abd-al Haqq, known professionally as Amanat Khan Shirazi. Abd-al Haqq also received attribution for his calligraphy, an exceptionally rare opportunity for the era. Ever the humble gentleman, Abd-al Haqq inlaid his John Hancock with the humble, “Written by the insignificant being, Amanat Khan Shirazi” at the base of the interior dome. 9. THE PALACE GARDEN TRANSFORMED UNDER BRITISH IMPERIALISM. Contemporary Muslim culture influenced the Taj Mahal’s remarkably bountiful original garden, which included both rich foliage and more than 60 elaborate flowerbeds. This landscaping held up until India became part of the British empire and colonial powers imparted their own horticultural ideologies onto the palace lawn. Under English control in the late 19th century, the Taj Mahal’s greenery adopted a subtler character more common to British gardens. 10. THE TAJ MAHAL “HIDES” DURING TIMES OF WAR. The Taj Mahal’s status as an Indian icon has made it a vulnerable target in times of international hostility. During World War II and the collected wars waged between India and Pakistan throughout the 20th century, the Indian government and people have gone to great lengths to protect their valued landmark from attack. To this end, architects added extensive scaffolding that concealed the structure from airborne bombers. When the ruse was working, instead of seeing one of the wonders of the world, pilots would see what looked like a pile of bamboo. 11. THERE MAY HAVE BEEN A PLAN FOR A SECOND, BLACK TAJ MAHAL. A 1665 voyage to the Indian state of Uttar Prudesh left French explorer Jean-Baptiste Tavernier with stories of a colorful encounter with Shah Jahan just one year before the ruler’s death. Tavernier’s supposed conversation gave rise to the legend that Shah Jahan had abandoned plans to build a second palace across the Yamuna River. This mausoleum was supposedly meant to house the crypt to Shah Jahan himself, and was envisioned as a black complement to the Taj Mahal’s white façade. 12. 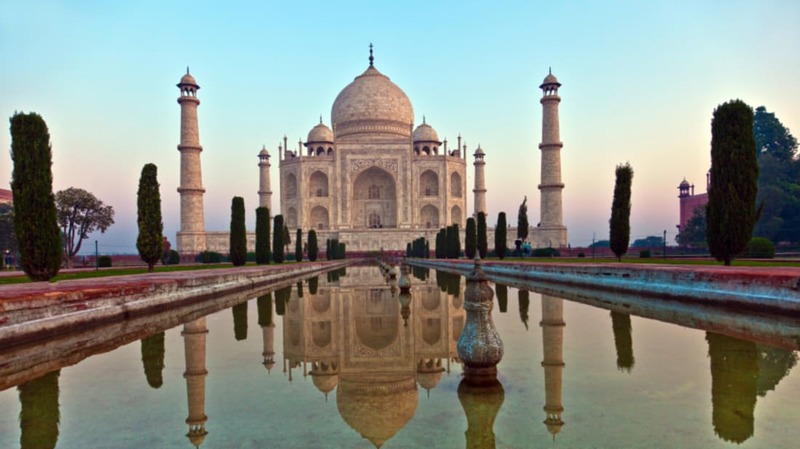 TWO SCHOLARS HAVE QUESTIONED SHAH JAHAN’S INVOLVEMENT WITH THE TAJ MAHAL’S CREATION. While whether Shah Jahan ever really intended to build the black Taj Mahal remains an open question, most scholars agree that he was indeed responsible for the first one. Not everyone is on board with this conclusion, though. Among the chief detractors are writer P.N. Oak and sociologist Amarnath Mishra. In 2000, the Supreme Court of India rejected Oak’s proposal to give credit for the Taj Mahal’s construction to the 12th century Hindu king Raja Parmar Dev, whom he theorized developed the building as a Shiva temple called Tejo Mahalaya. Five years after Oak’s failed endeavor, Mishra approached the Allahabad High Court to raise a similar point in the name of the long deceased monarch. Mishra’s movement was similarly unsuccessful. However, earlier this year, the district court of Agra allowed a new lawsuit claiming this, so it seems as though this theory isn't going away anytime soon. 13. AUTOMOBILES HAVE TO STAY AWAY TO KEEP THINGS GLEAMING. Cars and buses are strictly prohibited from coming within 500 meters of the Taj Mahal. The rule was put into effect to prevent exhaust from gasoline-powered vehicles from further tarnishing the exterior of the building. 14. THERE IS ONE WALL IN THE TAJ MAHAL THAT VISITORS KEEP PUNCHING. As a centuries-old mausoleum with both cultural and religious significance, the Taj Mahal has attracted a bit of a supernatural reputation. Among the more popular legends is one that involves spurts of water rushing forth as a result of hitting a carving of the palace located in the riverside forecourt. More specifically, the myth provokes visitors to strike the image at the silhouette of the finial—the cross-like structure at the very top of the Taj Mahal. Farfetched as it is, groundskeepers find consistent evidence, in the form of superficial damage to the carving, that visitors slam their knuckles against the wall. 15. SHAH JAHAN WAS NOT PERMITTED TO ENTER THE TAJ MAHAL DURING THE FINAL YEARS OF HIS LIFE. Nine years before Shah Jahan passed away, he fell gravely ill, which led to his sons fighting over succession. When Shah Jahan unexpectedly recovered, it was already too late. Two of his sons with Mumatz Mahal, Dara Shikoh and Aurangzeb, had begun fighting. Shah Jahan sided with Dara, but Aurangzeb emerged victorious, killing Dara and imprisoning their father in Agra to undercut any attempts to return to power. Thus, Shah Jahan was barred from visiting the Taj Mahal for the remainder of his life and was only allowed to view his monument from the grounds of his neighboring residence.